Ate at The Yard last night in Santa Monica. Top Chef contestant CJ is the head chef there. The food was wonderful, so props to him. A burger with the beef fround in-house? Delicious, and so flavorful with barely any seasoning. Still doesn't beat the Kitchen 24 burger though. That one's a gem. For dessert, I went with a chocolate selection, of course. 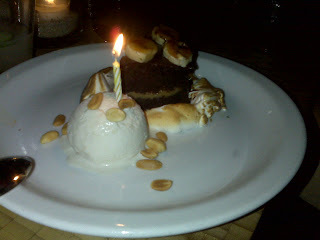 Chocolate cake with a peanut butter ganache and fresh banana ice cream. Beautifully plated with accents of caramelized bananas and charred marshmallow cream. Verdict? Good, but I don't know that I'd order it again. I'd probably just ask for an extra large scoop of the ice cream. Amazing. Like biting into a smooth, frozen banana, perfectly ripe. The chocolate cake left me wanting more, though. More chocolate. It was almost as if the cake was depending on the peanut butter ganache for flavor. Ganache was delightful, by the way. I'll be looking for a way to duplicate that and stick it in a cake somewhere. But there was nothing especially rich or chocolatey about the cake itself, it tasted similar to a plain chocolate box cake. I just wanted more. Infuse it with some melted semi-sweet chocolate, or use a little espresso in baking to bring out all that wonderful chocolate flavor please! So, I guess what I'm saying is, work on the main part of your dish, oh pastry chef of The Yard who's name I do not know, because the wonderful complimentary aspects are deserving of a better anchor.